The fierce argument over black slavery in the United States brought contention and hostility to Washington, DC, during the Civil War. One of the main issues that sparked the war in April of 1861, it also caused disagreements among citizens of Washington, the capital city and political center of the nation. 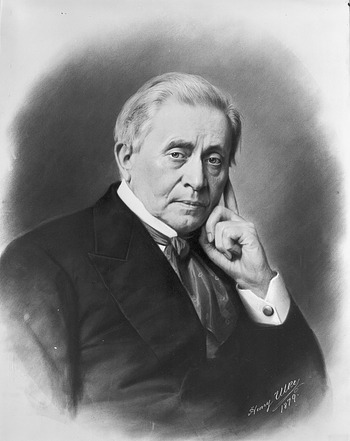 Joseph Henry, first Secretary of the Smithsonian, attempted to keep the Institution uninvolved in politics and focused on scientific pursuits. However, located in the heart of the capital, the Smithsonian could not escape the abolition debate. An 1861-1862 lecture series held in the Smithsonian Institution Building or “Castle” opened Henry and the Institution to accusations and criticism, despite Henry’s effort to avoid controversy. As the best auditorium in the city of Washington, the Smithsonian Lecture Hall was a highly sought after venue. The large room on the second floor of the “Castle,” seated two thousand people, and had been designed with optimal acoustics and sight lines. The hall was used for Smithsonian sponsored lectures, and was available for use by other organizations upon request. 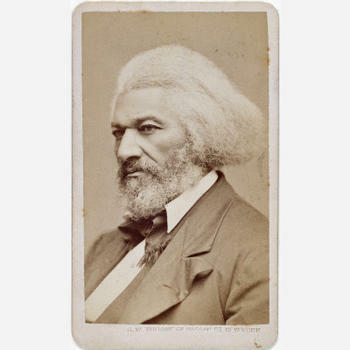 Henry decided who presented in the Lecture Hall and excluded speakers who addressed “any subject connected with sectarianism, discussions in Congress and the political questions of the day,” including divisive issues such as slavery and abolition. By limiting the content of the lectures, Henry intended to separate the Institution from partisan arguments, maintaining the Institution as a nonpolitical and unbiased organization. In 1861, a group of DC citizens formed the Washington Lecture Association (WLA) and petitioned Henry to use the Lecture Hall. Initially Henry denied their request, suspecting that the lecture series would be dominated by abolitionist speakers. Determined to secure the best venue in DC, the WLA applied again for use of the Lecture Hall in December of 1861. Though Henry denied them a second time, the WLA enlisted the help of their friends in government to convince Henry to relent. Among others, Representative Schuyler Colfax and Vice President Hannibal Hamlin, both Regents of the Smithsonian Institution, urged Henry to open the Lecture Hall to the WLA. Pressured by his own Board of Regents, Henry conceded. With Henry’s reluctant permission, the WLA held its first lecture of the series on December 13, 1861. From the start, Henry insisted that the Smithsonian Institution be absolved of any connection with the WLA or the lecture topics. The inaugural speaker, writer and abolitionist Orestes A. Brownson, was introduced by WLA President John Pierpont, a clergyman and abolitionist poet. Pierpont opened this and all later lectures with Henry’s disclaimer, proclaiming “I am requested by Professor Henry to announce that the Smithsonian Institution is not in any way responsible for this course of lectures. I do so with pleasure and desire to add that the Washington Lecture Association is in no way responsible for the Smithsonian Institution.”; Washington newspapers that reported on the event noted that the hall filled with laughter at Henry’s expense. Including Brownson’s, the WLA presented twenty-two lectures from December 1861 to April 1862. In total, twenty of the twenty-two speakers were known abolitionists, and even the nonpolitical lecturers focused on the issue of slavery. 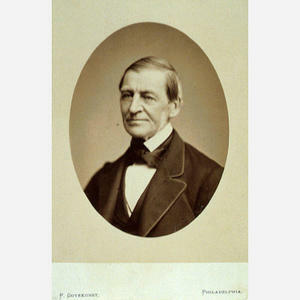 The WLA included Ralph Waldo Emerson, the writer and philosopher, in the series as a literary speaker to mollify Henry’s worry that the series would only feature abolitionists, but even Emerson concentrated on the topic of abolitionism. When the WLA proposed that Frederick Douglass, the leading African American abolitionist, conclude the series, an irritated Henry forbade it. 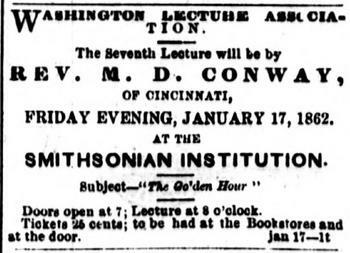 DC newspapers printed advertisements for the lecture series and reports on the proceedings following each speaker. These reports, which often contained a full transcript of the speeches, exposed the true abolitionist bent of the lectures. Some papers criticized Henry for trying to censor the topics of public speakers and supported Pierpont, who claimed that the WLA did not and would not “previously drill” the speakers on their topics. Other papers defended Henry, writing that the WLA had “deceived, imposed upon, [and] badly treated” him. 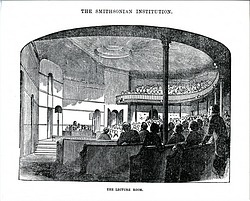 The lectures thrust Henry and the Smithsonian into the public spotlight, and the attention implicated that the Institution was associated with the abolitionist speakers. Throughout the series, an uncomfortable Henry required that the Smithsonian be frequently and undeniably relinquished of all responsibility for the lectures. The final WLA lecture was held on April 10, 1862. Following the WLA lectures, Henry restricted the use of the Lecture Hall to the Smithsonian and local schools. In his annual report for 1862, Henry defended this decision by explaining that the unrest caused by the lecture series had forced his hand. He wrote, the WLA “could not, or at least did not, observe the restriction as to [political] subjects […] The evil of this was soon manifest in acrimonious attacks upon the Institution.” Though Henry sought to keep the Smithsonian free from political controversy, the Institution could not avoid the passionate abolition debate that permeated Washington during the Civil War. Read more about the Civil War’s impact on the Smithsonian Institution in “Interruptions and Embarassments”: The Smithsonian Institution during the Civil War.